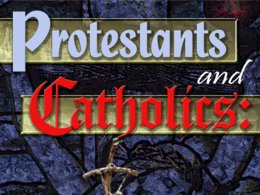 During my studies this week I found myself asking What is the difference between Catholics and Protestants?. Personally, I respect everyone’s choice in religious preferences and I keep leaning more and more toward non-denominational Christianity. I think that doctrines divide us more than bring us together. I also believe that God is seeking Unity while the enemy seeks to divide and conquer. I found a very interesting response to this question that I have pasted below. I would love your feed back. Now remember, this is not my opinion or research this was a google search that I found interesting and wanted to open some dialogue. There is a poll and contact form at the bottom. Please feel free to comment. One of the first major differences between Catholicism and Protestantism is the issue of the sufficiency and authority of Scripture. Protestants believe that the Bible alone is the source of God’s special revelation to mankind and teaches us all that is necessary for our salvation from sin. Protestants view the Bible as the standard by which all Christian behavior must be measured. This belief is commonly referred to as “sola scriptura” and is one of the “fivesolas” (solais Latin for “alone”) that came out of the Protestant Reformation as summaries of some of the differences between Catholics and Protestants. While there are many verses in the Bible that establish its authority and its sufficiency for all matters of faith and practice, one of the clearest is2 Timothy 3:16, where we see that “all Scripture is inspired by God and profitable for teaching, for reproof, for correction, for training in righteousness; that the man of God may be adequate, equipped for every good work.” Catholics reject the doctrine ofsola scripturaand do not believe that the Bible alone is sufficient. They believe that both the Bible and sacred Roman Catholic tradition are equally binding upon the Christian. Many Roman Catholics doctrines, such as purgatory, praying to the saints, worship or veneration of Mary, etc., have little or no basis in Scripture but are based solely on Roman Catholic traditions. Essentially, the Roman Catholic Church’s denial ofsola scripturaand its insistence that both the Bible and tradition are equal in authority undermine the sufficiency, authority, and completeness of the Bible. The view of Scripture is at the root of many, if not all, of the differences between Catholics and Protestants. 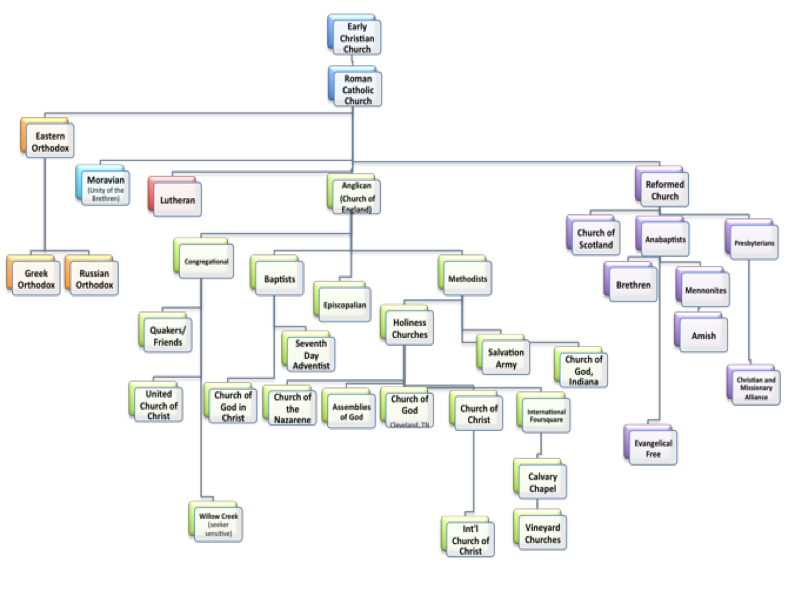 Another disagreement between Catholicism and Protestantism is over the office and authority of the Pope. According to Catholicism the Pope is the “Vicar of Christ” (a vicar is a substitute) and takes the place of Jesus as the visible head of the Church. As such, the Pope has the ability to speakex cathedra(with authority on matters of faith and practice), making his teachings infallible and binding upon all Christians. On the other hand, Protestants believe that no human being is infallible and that Christ alone is the Head of the Church. Catholics rely on apostolic succession as a way of trying to establish the Pope’s authority. 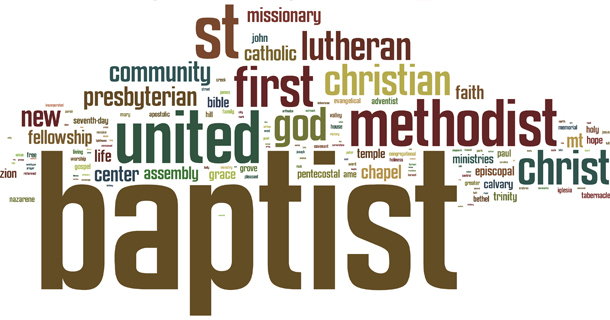 Protestants believe that the church’s authority comes not from apostolic succession but from the Word of God. Spiritual power and authority do not rest in the hands of a mere man but in the very Word of God. While Catholicism teaches that only the Catholic Church can properly interpret the Bible, Protestants believe that the Bible teaches God sent the Holy Spirit to indwell all born-again believers, enabling all believers to understand the message of the Bible. A third major difference between Catholicism and Protestantism is how one is saved. Another of the fivesolasof the Reformation issola fide(“faith alone”), which affirms the biblical doctrine of justification by grace alone through faith alone because of Christ alone (Ephesians 2:8–10). However, Catholics teach that the Christian must rely on faith plus “meritorious works” in order to be saved. Essential to the Roman Catholic doctrine of salvation are the Seven Sacraments, which are baptism, confirmation, the Eucharist, penance, anointing of the sick, holy orders, and matrimony. Protestants believe that, on the basis of faith in Christ alone, believers are justified by God, as all their sins are paid for by Christ on the cross and His righteousness is imputed to them. Catholics, on the other hand, believe that Christ’s righteousness is imparted to the believer by “grace through faith,” but in itself is not sufficient to justify the believer. The believer must supplement the righteousness of Christ imparted to him with meritorious works. Catholics and Protestants also disagree on what it means to be justified before God. To the Catholic, justification involves being made righteous and holy. He believes that faith in Christ is only the beginning of salvation and that the individual must build upon that with good works because God’s grace of eternal salvation must be merited. This view of justification contradicts the clear teaching of Scripture in passages such asRomans 4:1–12,Titus 3:3–7, and many others. Protestants distinguish between the one-time act of justification (when we are declared righteous by God based on our faith in Christ’s atonement on the cross) and the process of sanctification (the development of righteousness that continues throughout our lives on earth). While Protestants recognize that works are important, they believe they are the result or fruit of salvation but never the means to it. Catholics blend justification and sanctification together into one ongoing process, which leads to confusion about how one is saved. A fourth major difference between Catholics and Protestants has to do with what happens after death. Both believe that unbelievers will spend eternity in hell, but there are significant differences about what happens to believers. From their church traditions and their reliance on non-canonical books, the Catholics have developed the doctrine of purgatory. Purgatory, according to theCatholic Encyclopedia, is a “place or condition of temporal punishment for those who, departing this life in God’s grace, are not entirely free from venial faults, or have not fully paid the satisfaction due to their transgressions.” On the other hand, Protestants believe that because we are justified by faith in Christ alone and that Christ’s righteousness is imputed to us—when we die, we will go straight to heaven to be in the presence of the Lord (2 Corinthians 5:6–10andPhilippians 1:23). One disturbing aspect about the Catholic doctrine of purgatory is the belief that man can and must pay for his own sins. This results in a low view of the sufficiency and efficiency of Christ’s atonement on the cross. Simply put, the Roman Catholic view of salvation implies that Christ’s atonement on the cross was insufficient payment for the sins of those who believe in Him and that even a believer must pay for his own sins, either through acts of penance or time in purgatory. Yet the Bible teaches that it is Christ’s death alone that can satisfy or propitiate God’s wrath against sinners (Romans 3:25;Hebrews 2:17;1 John 2:2;1 John 4:10). Our works of righteousness cannot add to what Christ has already accomplished. It is our prayer that God will open the eyes of those who are putting their faith in the teachings of the Catholic Church. It is our hope that everyone will understand that his “works of righteousness” cannot justify him or sanctify him (Isaiah 64:6). We pray that all will instead put their faith solely in the fact that we are “justified freely by his grace through the redemption that came by Christ Jesus. 25God presented Christ as a sacrifice of atonement, through the shedding of his blood—to be received by faith” (Romans 3:24–25). God saves us, “not because of righteous things we had done, but because of his mercy. He saved us through the washing of rebirth and renewal by the Holy Spirit, whom he poured out on us generously through Jesus Christ our Savior, so that, having been justified by his grace, we might become heirs having the hope of eternal life” (Titus 3:5–7).